They’ll walk out to the bleachers; sit in shirtsleeves on a perfect afternoon. They’ll find they have reserved seats somewhere along one of the baselines, where they sat when they were children and cheered their heroes. And they’ll watch the game and it’ll be as if they dipped themselves in magic waters. The memories will be so thick they’ll have to brush them away from their faces. 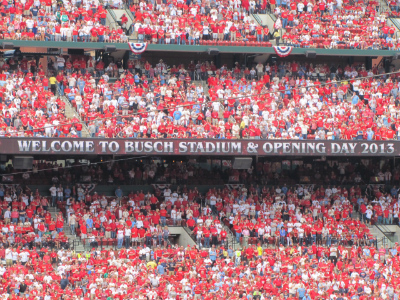 Memories — those are what the Cardinals home opener is really about. Honoring the past, with the Hall of Famers resplendent in red blazers. Honoring the present, with today’s players getting individual adulation. Creating future memories for the kids in attendance, and all of us as adults too. My two Cardinals openers were in 2005 and 2012 — both, obviously, the year after trips to the World Series, and both were memorable. Sure, there was seeing the National League pennant raised in 2005 (just like those attending today will see) and the World Series championship flag two years ago. But what really stands out are seeing the players, past and current-at-the-time. In 2005, our seats were a few rows up in left field so I had an up-close view. There are two players who made the most lasting impression as they went by in their convertibles: So Taguchi, who was waving and bowing at the crowd continuously, and Larry Walker, in his one and only Cardinals home opener. He too was waving often, sometimes a goofy parade wave and other times a regular one, but there’s one thing that I’ll never forget: the grin. Ear-to-ear and nonstop, as the cheers roared from each section as he passed by. And Larry is who immediately came to mind when I read Bernie Miklasz’s column this morning, which so captured the essence of how truly special Cardinals opening day is, and these thoughts from Lance Lynn. That’s what is always so cool, seeing those first-timer reactions — just like it will be today to see players like Peter Bourjos and Mark Ellis or Pat Neshek and Jhonny Peralta, who’ve been through other opening days throughout the big leagues. Now they’ll get to see what Cardinal Nation is truly about, what it means to be a Cardinal. How many more hours are left? This entry was posted in 2014 Cardinals and tagged 2005, Hall of Famers, Home opener, Lance Lynn, Larry Walker, Opening Day, So Taguchi by Christine Coleman. Bookmark the permalink.